Text Once per turn: You can target 2 "Monarch" Spell/Trap Cards in your Graveyard; shuffle them into the Deck, then draw 1 card. 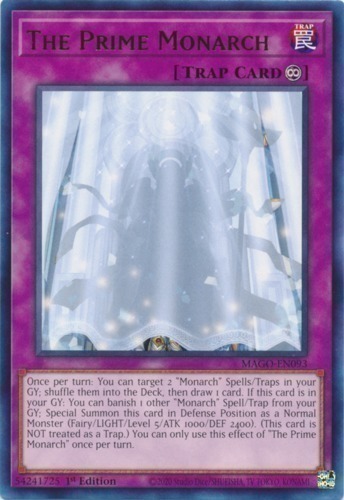 If this card is in your Graveyard: You can banish 1 other "Monarch" Spell/Trap Card from your Graveyard; Special Summon this card in Defense Position as a Normal Monster (Fairy-Type/LIGHT/Level 5/ATK 1000/DEF 2400). (This card is NOT treated as a Trap Card.) You can only use this effect of "The Prime Monarch" once per turn.